<3 Hey, beautiful romantics! I'M WORKING ON BUILDING A BETTER SITE SO IT'S CURRENTLY A "WORK IN PROGRESS"...getting there! It's finally Spring and I've been feeling super-motivated to create! GET YOUR FLORAL FIX HERE and in my ETSY and AMAZON HANDMADE shops! I am adding new items all the time so be sure to have a look! Plus I am offering FAST, FREE SHIPPING on most items! : ) Be sure to follow me on Instagram, Pinterest, and "like" my Facebook page for updates and special offers! FLORAL TASSEL NECKLACE! 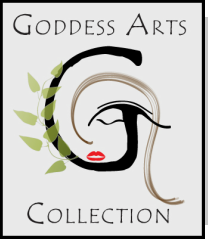 A uniquely feminine and flirty piece of one-of-a-kind wearable art! ROSE BLING RING! 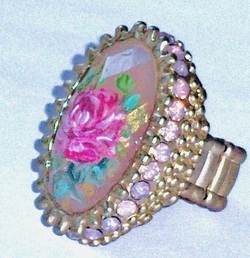 A casually-elegant ring featuring a painted rose cabochon and sparkling rhinestones in a brushed gold frame! ROMANTIC BOHO! Painted pink roses on a filigree medallion and a jet black Swarovski crystal pendant, suspended from a black ribbon necklace! NOW OFFERING! Portrait Pendants hand-painted from your photographs! ROMANTIC FLORALS An original cuff bracelet featuring a pretty rose design, painted gold flourishes, and tiny Swarovski crystal accents! ARTFUL CELESTIAL EARRINGS! A whimsical pair of painted moonface pendants, with dangling enameled star charms and crystal beads! JUST PAINTED! Gorgeous pink roses framed within an impressive silver pendant! A One-of-a-kind statement piece! ROSE CHIC Hand-painted decorative floral scarves in assorted colors and thicknesses....some with beaded accents! ARTFUL AND DECORATIVE Mucha-Inspired hand-painted Ceramic Canister!